﻿ Kush Oil Cartridges: What Types of Strains are Available? KushOil.com offers a variety of popular indica, sativa and hybrid strains in our famous Kush Oil Cartridges. In this article we will discuss the various strain types available and how they differ from one another. Please keep in mind that our available stock in the different strains will vary depending on availability and stock from our suppliers. Check the shop for up-to-date strain availability in the cartridges. Indica Strains are known to provide a strong body high with relaxing and sedating effects that are well suited for nights when you just want to wind down and be in your own head. Indicas are often used to relieve stress and aid with sleep. Indicas have long been known to provide intense body effects, such as relaxing muscles and loosening your limbs. If you are suffering from severe pain in your body, then we’d recommend you try a powerful indica strain for pain reduction. The effects of Indica strains are often associated with what many people would call being “stoned” or “high”, such as your physical senses being heightened while watching a movie, listening to music, eating food or munchies, or touching various textures. Sativa strains are often referred to as the ideal daytime strains because these strains often provide energetic and uplifting effects, which is nearly the opposite of indica effects. Sativa strains are commonly associated with energy, creativity, unique thinking and better mental focus. If you want to use your Kush Oil cartridges in the morning or mid-afternoon and be productive without fatigue, then you’re going to want to try a sativa cartridge. Sativa strains are popular among artists, musicians and philosophers because they help with creativity and coming up with new ideas. Some sativa strains have been found to enhance lights and sounds, make your environment more vibrant, and enhance your physical senses. Hybrid strains were developed from cross-breeding Indica and Sativa strains to create new, unique strains that provide a unique mix of both strain’s effects. Today in 2018, there has been so much cross-breeding among strains that there are literally hundreds of hybrid cross strains. Hybrid strains are typically either Indica-dominant or sativa-dominant meaning they have more of one strain’s effects than the other. This is often measured in a ratio such as 80% - 20%, 70% - 30%, or 60% - 40%. Website’s such as Leafly.com provide detailed information on whether a hybrid strain is indica or sativa dominant. In the rare occasion, some hybrids are a perfect 50-50 mix of indica and sativa. We recommend you do some research on each hybrid strain you are considering to see what that strain’s unique effects are. If you prefer CBD over THC, we also offer the Charlotte’s Web CBD strain in a 0.6 mL cartridge. The cartridge uses the same battery pack as the others and functions the same, but contains so little THC that you will not feel high or stoned. Charlotte’s Web CBD was developed in Colorado to help children and medical patients suffering from severe medical conditions. You still get the medical benefits of the full spectrum plant including all the cannabinoids and terpenes, just with minimal THC% and no “stoned” or “high” effects. 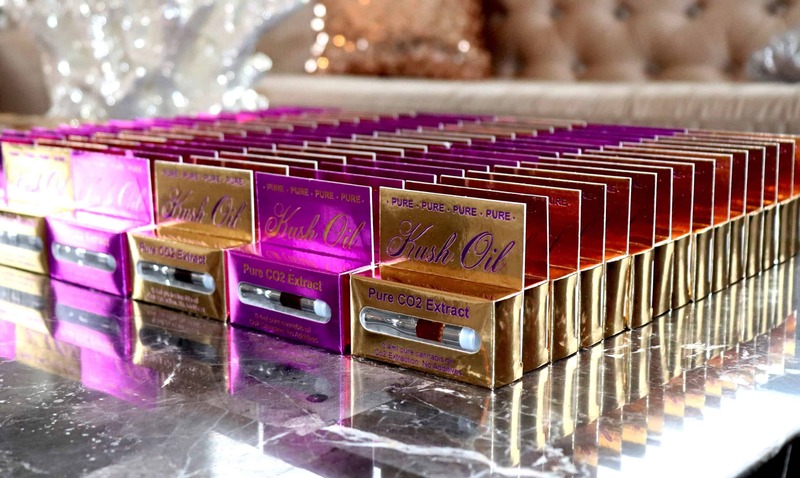 We have a variety of Kush Oil cartridges available in the online store. Please check there for current strains offered in the indica, sativa, and hybrid cartridges.